We spent the first night of our recent two week trip to the National Parks of southern Utah in Gallup, New Mexico. What’s in Gallup? Not much, as far as we could see. But to be fair, we got there in early evening, after everything had been shuttered and barred and locked, and no town really looks inviting in that state. I did, however, see the one History Tourist attraction that was available to us: two statues in front of the Gallup Cultural Center. 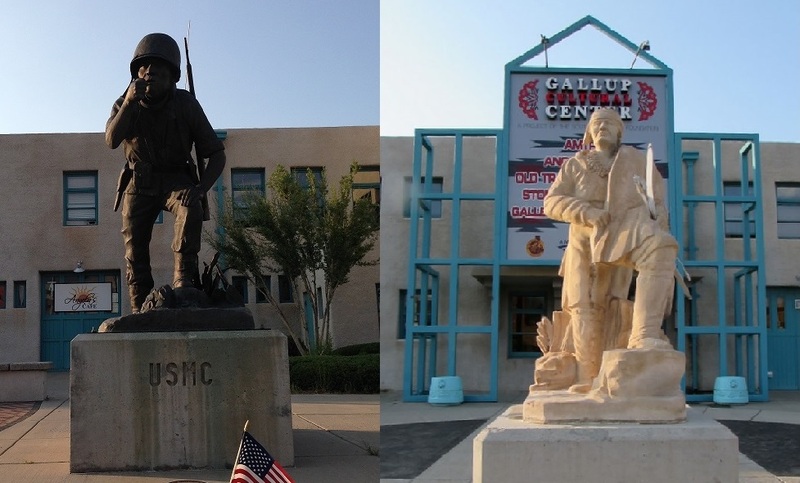 One is a World War II Navajo Code Talker, sculpted by Navajo artist Orland Joe and dedicated in 2005. The other is a sculpture of Navajo Chief Manuelito (1818-1894), a leader of the resistance to the 1864 forced walk of the Navajo from their homes in Arizona to New Mexico. I am an obsessive planner. When I go on a trip, I want to know what I’ll be doing during the day (if not to the second, then to the minute) and where I’ll be laying my head at night. Spontaneity is Satan’s creation and nay … nay I say … I will not be lead down that evil path. My insides were right. We shouldn’t have deviated. We should have realized when we couldn’t find an address for a visitors center, or any address connected to it at all, that it would be hard going. Thirty-two million acres — how could we miss it? Well. We drove around and around in circles, up one endless dirt road after another for about an hour. Finally, we found — completely by coincidence — a sign that said “Hovenweep National Monument 30 miles.” It wasn’t on our itinerary either, but we followed the signs to Hovenweep. It turned out that we been in the Canyon of the Ancients all along. There just hadn’t been any signs identifying it as such. The Canyon encompasses Hovenweep, the ranger in the Hovenweep visitors center told us. Managed by the Bureau of Land Management, the Canyon has no official visitors center. It’s a rough, vast, undeveloped area and to see the archaeological sites means taking a four wheel drive vehicle down dirt roads. Our tiny, rented, zero power Chevy Sonic was not going to make it. So we toured Hovenweep instead. 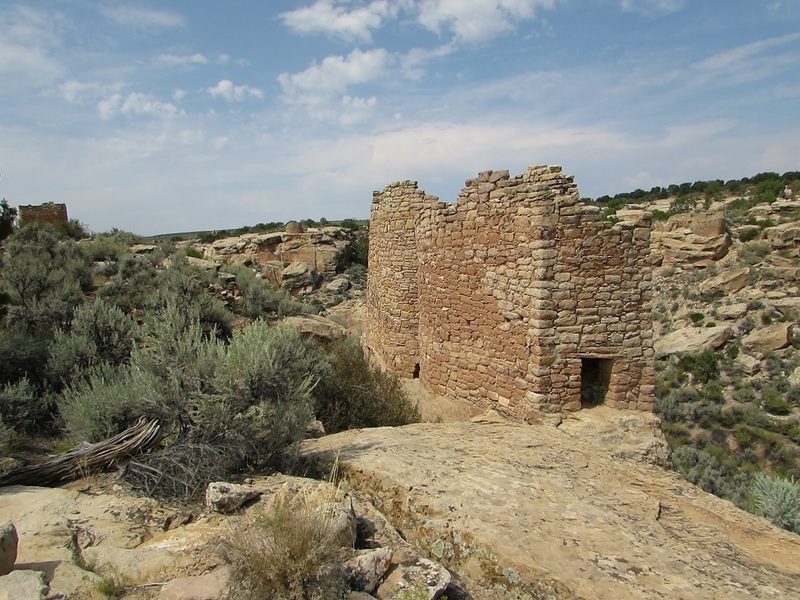 Hovenweep National Monument contains the ruins of six Puebloan villages, built mostly between 1200 and 1300. The Puebloans were a stationary, farming people who settled the area in about 900. At its most populated, there were about 2500 people living in the area. In 1874, photographer William Henry Jackson visited and named the area Hovenweep, which means deserted valley in Ute. Because of its well-preserved and unusual buildings, Hoventweep was designated a national monument in 1923. The structures, built along the rim of a canyon, look very much like small, medieval European castles, with roundish towers on the corners. 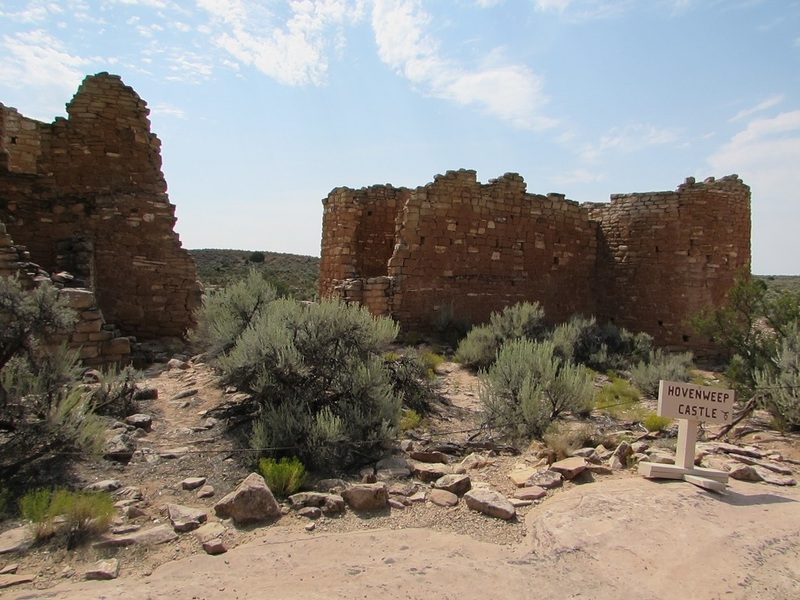 In fact, one of the ruins was called Hovenweep Castle. “The growth rings on a wooden beam in one tower indicates that the log was cut in 1277” says a trail guide. … and back up again on the other side of the narrow canyon. 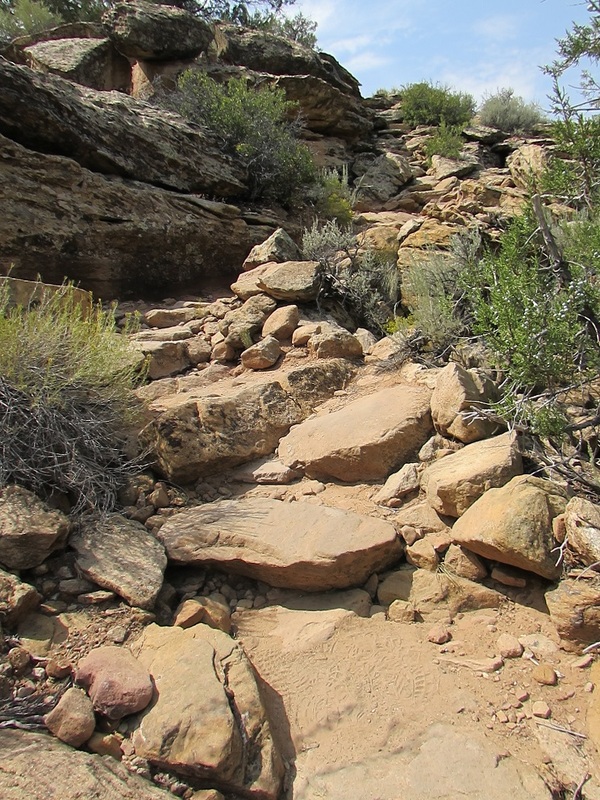 Then the trail followed along the rim of the canyon, past nine structural groups. I’m not going through all of them, but the Twin Towers (below) are “among the most carefully constructed buildings in the entire southwest,” claims the trail guide. They stand on bedrock on the very edge of the rim, are made of sandstone, had 16 rooms and are almost touching. Hovenweep was a worth the two hour stop. It was a good example of what we would have seen had we had the wherewithal to explore other parts of the Canyon of the Ancients. Plus, it was good for an unexpected stamp in my National Parks Passport. In Gallup, we stayed at the Hampton Inn West, which we’d recommend as a good example of a clean, modern, mid-priced hotel. It was on Historic Route 66, right off I-40, about a mile from downtown Gallup. We had dinner at the the Badlands Grill, just a couple of minutes down Route 66 from the hotel. It advertises itself as “fine dining,” but I’d call it a decent family-type restaurant. It specializes in steaks (which I don’t eat), but they also did a very good job on my seared ahi salad. Gallery | This entry was posted in New Mexico, Utah and tagged Canyon of the Ancients, Chief Manuelito, Gallup NM, Hovenweep, Navajo Code Talker. Bookmark the permalink. I visited Four Corners in 1995 but it was a lot simpler twenty years ago, just a plaque in the ground! On the same trip I visited Mesa Verde National Park. Four Corners is now a big deal — large marketplace surrounding a large, fancy, inlaid plaque. We missed Mesa Verde. Next time. Back in 2014 when we did our Southwest trip, Hovenweep was on the itinerary and somehow we missed the sign, so didn’t go. It is on my list of places to get back to. 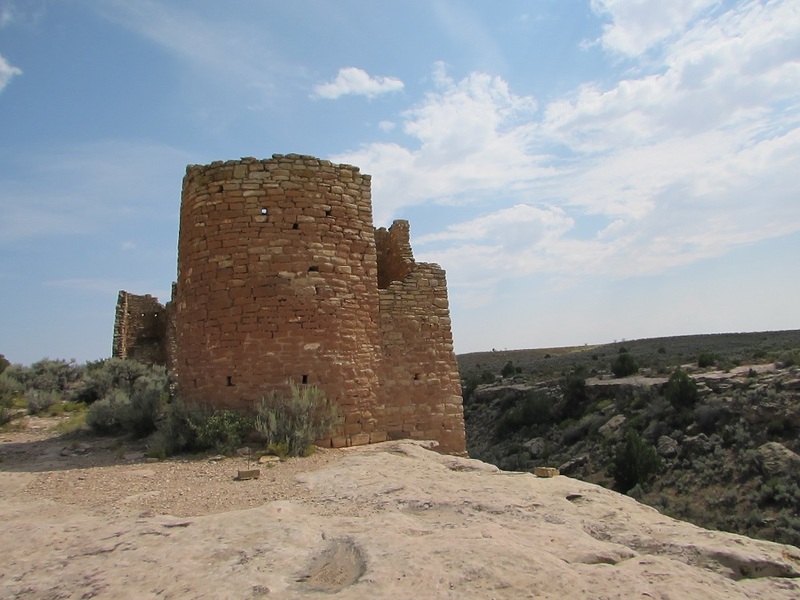 If you like Hovenweep, you would love Chaco Canyon in NM. Hovenweep was terrific and definitely worth a visit. We’ll be planning a New Mexico-only trip in the foreseeable future, so we’ll be sure to put Chaco Canyon on the itinerary. Chaco Culture NHP is so worth the visit. It is a dark sky park; camping there is on my bucket list. Be aware that the road there is absolutely horrible. Miles of very rough gravel/dirt road. Be patient and go slow. It is passable even in a 2WD car; you just have to go slow. And it becomes paved again in the park. The horrible road makes me want to go even more. Something special about hard-to-access places.